DO you ever feel stuck or ensure what to do next? If there is something you would like to achieve, but feel a bit lost or ensure? one way you can really help yourself, is to ensure you have the support to help make it happen! This can be in a variety of different forms including, professional support, coaching, mentoring, being part of a mastermind group. Or seeking out the assistance of an individual, or group of individuals who have experienced, or who have already achieved the outcome you want, by learning from the experience and expertise of others. Do You Support Your Own Success – self support, are you supporting yourself through continuous learning and self-development, reading books, listening to audio programmes, watching youtube videos like this. Do you follow people won social media that support and encourage you to achieve the life you want to achieve? Does your self-talk and the language you use support you and your goals? The language we use and the questions we ask ourselves has the ability to focus our mind and our actions either towards what we want or further away from it. Do you set goals and take continuous action to support your goals? Does your environment and the people you spend the most time with support you. Remember you don’t have to go it alone, or rely on external support, set yourself up with the best support network you can from the inside out. 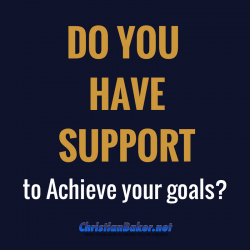 Click here to leave a comment below with who, or what supports you in your life.